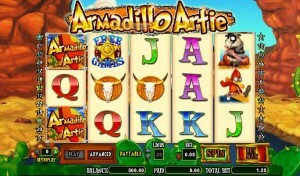 The slot’s action revolves around creatures of the desert, and yes, Armadillo Artie is the star of this game. It’s a Cryptologic slot machine, whose graphics should prove to be fun to experience, with a theme used that is not unusual, but not that easy to find either. The game has a certain Wild West vibe to it, with various symbols like sheriff stars, mounted cow skulls, cactus plants and so on. The slot’s maximum number of paylines goes up to 25, the game having a total of 5 reels to host them. There are free spins offered, bonus games, scatters and wilds, with the jackpot being worth $10,000. 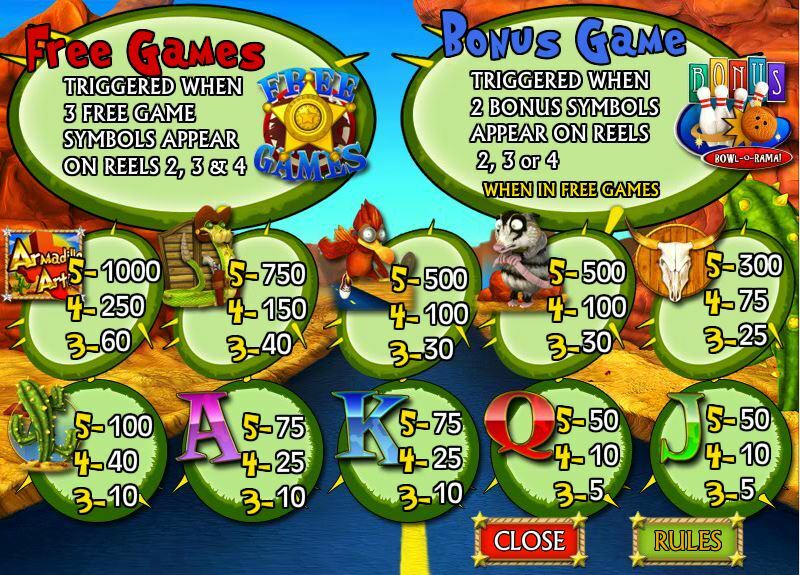 The feature list includes a very interesting wild, with expanding abilities that work on the horizontal, plus scatter symbols, a round with free spins and a bonus game. To start with, let’s see how that wild symbol works. It’s the most impressive feature of all, mostly because it works differently than in other slots. The substitution ability is the same one, allowing this symbol to help you create new combinations by taking the place of regular icons. The part that is different is the fact that it can expand horizontally, to the right. All the symbols that are to the right of the wild, on the same row, will become wild. For example, if you get it on the 1st reel, you will get a total of five wilds on that row. With a 3rd reel wild, there will be only three wilds on the row. Wild symbols only work together with regular icons, so the Bonus and the Free Spins scatters are not influenced by its presence. You will find that the middle three reels will host scatter symbols from time to time. In the base game, the Free Games Sheriff Star is the one that is visible. You need three of these icons, scattered on the reels 2, 3 and 4, to get the 10 free spins. 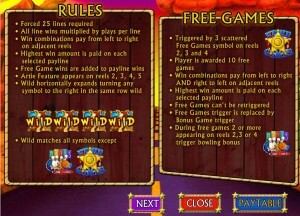 While the base game spins pay from left to right, the free spins also form combinations from the right to the left. Unfortunately, the free spins can’t be triggered again, but you get a chance to start a bonus feature instead. The bonus game that is offered through the free spins starts up when a minimum of two Bonus symbols are on the middle three reels. This is only offered during the free spins. 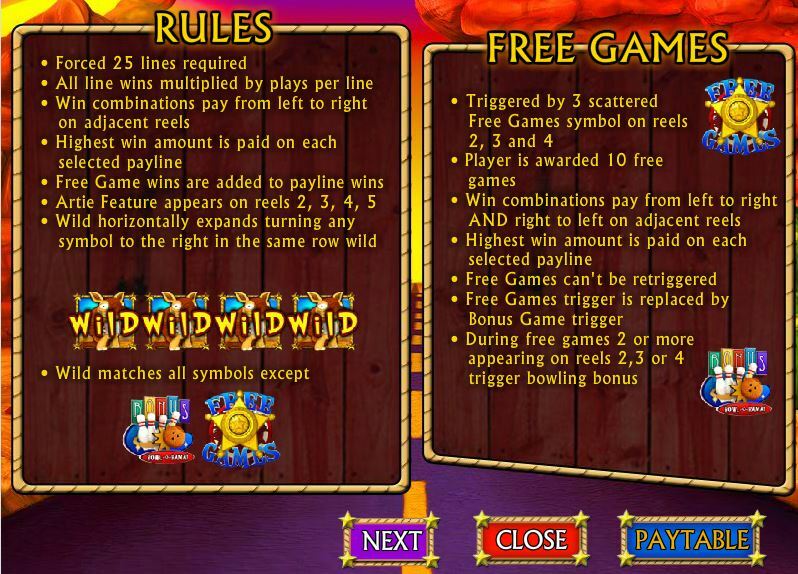 Started when 2+ Bonus icons appear during the free spins, Bowling Bonus gives you three frames, with one roll for each one. You use arrows to choose the direction of the roll, and you get a score at the end of the game. Up to 30x the bet is won in this bonus game. You can change the number of lines and the line bet, that’s all. There is only one coin used for each line, but it goes from as little as $0.01, to as much as $10. Since 25 lines are available, the maximum bet is worth $250. With the Armadillo Artie Logo taking up an entire payline, you get 1,000 coins out of it, which means $10,000 in the best case scenario. Though the game has a cartoon like design for its symbols, they’re also done in 3D, so you feel like you’re part of the action. The desert is visible behind the reels, with symbols including things like cactus plants, cow skulls, snakes, raccoons and the usual collection of playing cards. It’s not necessarily a great looking game, but you can’t say that the designers didn’t work hard on it. All the details are there, it’s just the design style that isn’t very appealing. Symbols: Coyote (wild), Free Games Badge (scatter), Bowling Pins (bonus), Armadillo Artie Logo (1,000x), Snake (750x), Bird (500x), Raccoon (500x), Cow Skull (300x), Cactus Plant (100x), Ace (75x), King (75x), Queen (50x) and Jack (50x). The game has some great things to offer, especially when the features are involved, with all the modern options available. I’m not terribly happy about the $10,000 jackpot, or about the quality of the design. 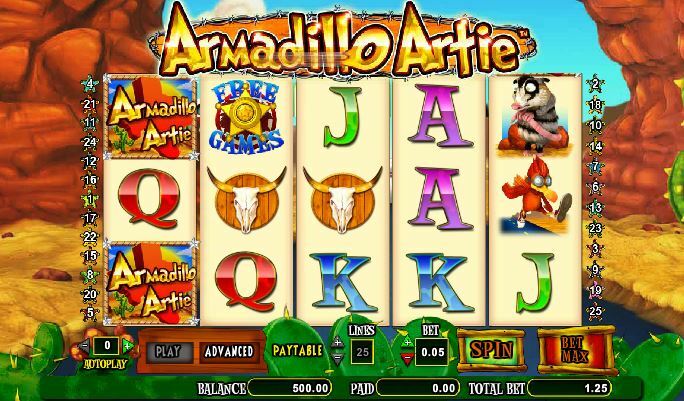 You will find Armadillo Artie at any online casino which chooses to use software from Cryptologic, playable either for free or for real money.